The Beaumont Apartments, 730 Riverside Drive, Manhattan. Image Credit: LPC. 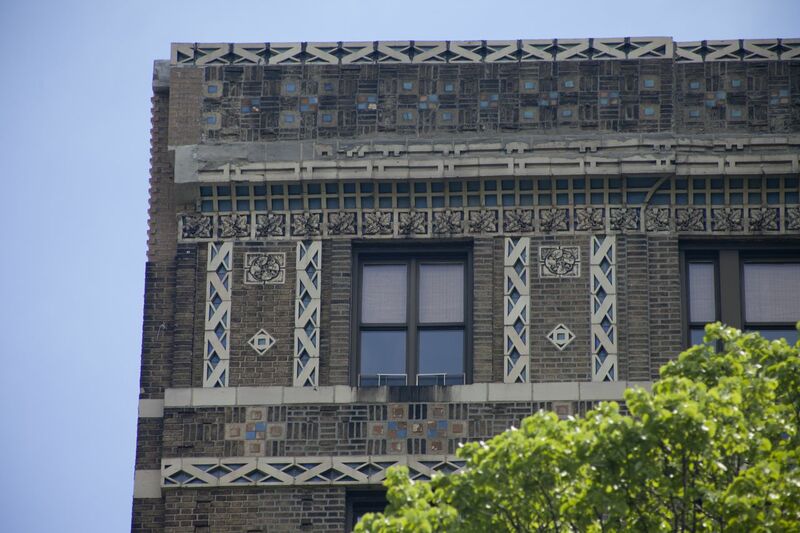 Residents, local cultural organizations, and preservationists testified in support of designation of ornate Arts & Crafts-style apartment building; owners deny any architectural significance. 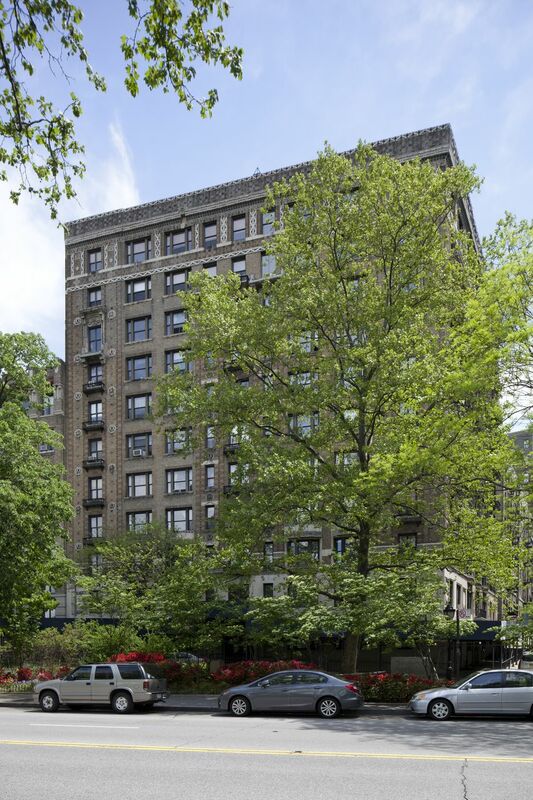 On June 18, 2013, the Landmarks Preservation Commission held a hearing on the potential individual landmark designation of the Beaumont Apartments, at 730 Riverside Drive at the corner of 150th Street, in Harlem. The building was constructed in 1912-1913 to the designs of George and Edward Blum, French-born architects specializing in apartment buildings. The eleven-story structure features a wide array of decorative brickwork and terra cotta ornament above its two-story limestone base, including foliated terra-cotta bandcourses and octagonal panels with birds in high relief. U.S. Representative Jacob Javits and singer Marian Anderson were tenants of the building, and Ralph Ellison, author of Invisible Man, was also a long-time resident. Tenant John Martin Green testified that “history fairly oozes through both the structure and the legacy of the Beaumont,” and argued for an understanding of the building as a smaller-scale relation of such grand apartment buildings as the Dakota and the Ansonia. Green alleged that previous owners had removed wrought-iron balconies, and destroyed terra-cotta detailing, and that the current owners had filed applications with the Department of Buildings for further demolition. Christabel Gough, of the Society for the Architecture of the City, noted that at the time of the Beaumont’s construction, the neighborhood was still a “romantic outpost” of the City, occupying the former estate of John James Audubon and was near the recently established campus of Columbia University. Author Thomas Wirth testified that the property was once owned by Edward Atkinson, a lover of Countee Cullen, an American poet and an active figure in the Harlem Renaissance. At the well-attended hearing, John Reddick, of the Ralph Ellison Memorial Committee, urged Landmarks to “advance the designation … immediately.” Dale Dobson, who had known Ralph Ellison while growing up in the Beaumont, said that the Ellison family would have attended the hearing “with bells on” to support designation were they still alive, and added that designation was important to preserve the context of the memorial. Landmarks Chair Robert B. Tierney stated that Council Member Robert Jackson had communicated his support for designation to the commission, calling the building “a Harlem treasure.” The Historic Districts Council is also in favor of designation. The Beaumont’s facade. Image Credit: LPC. Attorney Scott Maslin, speaking on behalf of the owners, 730 Riverside Owner, LLC, spoke in opposition to designation, saying the building lacked special character or historical or aesthetic interest. Maslin stated that the Blums’ work was considered “conventional,” and that there were many other similar apartment buildings in the area. Maslin said the owners did not intend to demolish the facade, but wanted to make the building “the best living environment for our tenants as possible.” He also said Landmarks was an improper forum for tenants to voice their frustrations. A vote on designation has not yet been scheduled. Update (6/26/13): Just one week after holding a public hearing, Landmarks reconvened on the issue on June 25, 2013, and unanimously voted to designate the Beaumont Apartments as an individual City landmark. Commissioner Libby Ryan called the building “a spectacular landmark.” Commissioner Margery Perlmutter selected as noteworthy the exuberant “textile-like” facade ornamentation which she said “still retains its elegance.” Commissioner Michael Devonshire also praised the architecture of the building, calling it one of the Blums’ best works, “as if the social history wasn’t important enough” to merit designation. The vote was met by applause and tears from designation proponents in the audience. LPC: The Beaumont Apartments, 730 Riverside Drive, Manhattan (LP-2545) (June 18, 2013).